These guidelines outline the general rules when using FCR’s brand assets and showcasing FCR’s content. Consistent use of these assets helps people easily recognize references to FCR and protects our company brand and image. Do keep enough space around FCR’s brand assets to keep them clear, unique, unattached to another brand, and uncluttered. Do maintain the shape and proportion of each of FCR’s brand assets and reproduce assets at a legible size. FCR’s logo should not be distorted from its original shape and proportion to “fit” into your content. 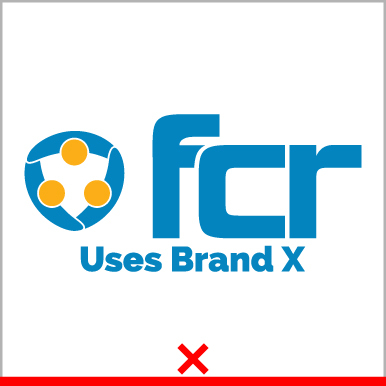 Content should be created around the original shape and proportion of the FCR logo. Do display the word “FCR” in the same font size and style as the content surrounding it. Do capitalize the letters “FCR,” except when it’s part of a web address. Don’t assert any rights over the FCR brand or logo whether by trademark registration, domain name registration or anything else that would suggest you or your company owns the rights to our brand, logo, or image. Don’t modify FCR’s brand assets in any way, such as by changing the design or colors. Trademarks, names, domain names, logos or other content that imitates or could be confused with FCR. Any icons, images or trademarks to represent FCR other than what is found on this resource center. Any combination of any part of the FCR brand or logo with your name, marks or generic terms. Implies partnership, sponsorship or endorsement. Makes our brand or logo the most distinctive or prominent feature of what you’re creating. Features FCR on materials considered to be objectionable, illegal activities, or other materials that one would consider offensive. Don’t pluralize the FCR brand name, use it as a verb, abbreviate it, or change order of the letters. Don’t use the FCR logo in place of the word “FCR”. FCR doesn’t permit or license its brand, logos or other intellectual property for use on merchandise or other products such as clothing, hats or mugs. FCR’s assets and brand, including its logo, are owned by FCR and may only be used as provided in these guidelines or with FCR’s permission. You may not use or register, or otherwise claim rights to any FCR asset, including as, or as part of, any trademark, service mark, company name, trade name, username or domain registration. You should not use or claim rights to the letters F, C, or R that are in any way confusingly similar to or dilutive of FCR, including as, or as any part of, a trademark. Do not use FCR’s assets or logo for anything that would be inconsistent with our company’s values, image, or business. We may revoke permission to use FCR’s assets or logos at any time. FCR reserves the right to withhold approval of content that it feels is inconsistent with the FCR brand.